Can you actually use an Air Mattress as a permanent bed? Air mattresses aren’t ever really designed to be a replacement for your regular bed. Anyone who says otherwise is not being completely honest. 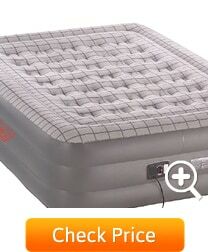 BUT, if do your research and choose your air mattress wisely, you’ll be sleeping like a baby for weeks at a time, without any loss of comfort or quality. We recently had family moving in and needed to find a solution that could be used as a daily sleeper. Thankfully, the modern designs with built-in electric air pumps, clever structural support and high quality materials blew us away with their comfort and longevity. Join our hunt for the absolute best air mattress for everyday use as we look at the strengths and weaknesses of the top choices available today. Here’s our winner! When it comes to hassle free, everyday use, the SoundSleep Dream Series is the highest quality product we’ve found. You could easily spend weeks sleeping in absolute comfort with little to no air overnight air loss. As with any of the models, there will be some initial “stretching” which will look like air loss. Should you experience any sagging, the high powered air pump re-inflates the cell in seconds and you’re right back to sleep. The wall’s construction is extremely solid and the material is more “puncture proof” than you’ll find in any competitor. This is not the cheapest product available, but at this level of quality, the value for money is absolutely fantastic as you’ll save thousands on replacements. The additional one year guarantee makes the deal even sweeter. 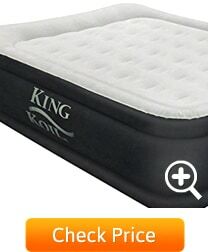 At 20 inches, the King Koil is 2 inches higher than usual, which offers just a little more comfort than its competitors. Of all of the air mattresses, this is the one that feels most like a real mattress! Getting up is also easier with the raised height. Even though it’s higher, structural integrity is solid and robust. This is especially important if you’re sharing the bed with someone or if you are heavier than average. The soft quilt top adds just a little bit of luxury to the sleeping experience. It’s really no surprise that the King Koil is this close to winning. They have the longest track record in the mattress industry and the company knows what the customer needs: An excellent quality product with a 1 year guarantee and outstanding customer support. Honestly.. none. It’s just a killer Product! The Insta-Bed has a second “Never Flat” pump that quietly keeps your bed inflated during the night! This might seem like overkill, but it really works. 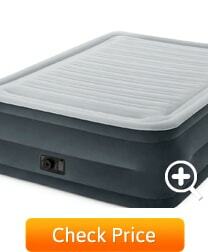 You simply leave it on overnight and it keeps the mattress fully inflated, even if you move around a lot. You can choose between 3 levels of firmness while you sleep. There are some cases in which leaking was a slight problem, but this seems to be localized to individual products, not the brand. If you have any problems with the product, customer support is right there to assist. Additionally, Amazon has a fantastic returns policy. 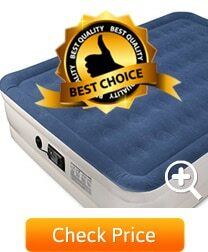 Coleman prides themselves on being one of the most air-tight mattresses on the market. The valves are high quality and the seals have been factory tested for leak-free performance backed by a 1 year guarantee. Their premium mattress comes in at a pricier level which may be a deterrent for some people. It’s not particularly better quality than the SoundAsleep or the KingKoil but you do get the Coleman brand name included. It comes with a suede sleeping surface and two different patterns: Grid or Striped. Of all the products on the list, the Intex would be the one we would be the most worried to use as an everyday mattress. It’s much more of camping product and will take the most strain. The reason it made it onto this list is because of its price. The Dura-Beam comes in at nearly half the price of its competitors and this makes it a great option for someone who plans of using it less frequently. It’s a little smaller than its competitors too at only 60 inches wide. 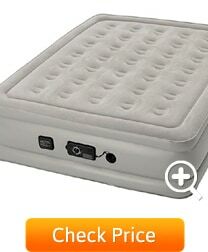 However, this is the highest mattress on the list at 22 inches. Unfortunately, it doesn’t quite have the support needed to make those 22 inches stable and you feel a bit like you’re sleeping on a marshmallow. If you really are planning to sleep on it more than a few times a month, you should look at the SoundAsleep or the KingCoil above. These products are made from PVC which is a stretchable fabric. Over the first few times you use it, you’ll notice some sagging. Simply keep re-inflating the bed and this stretching will settle over time. Initially, the products will have an odor emitting from the material. This will go away after a couple of uses. This might seem completely obvious but you’d be surprised how many times you’re lying down with keys in your pocket or stretching over the mattress to plug in a cell phone charger. Also, make sure that the floor below the bed is free from any debris. Ironically, the most common puncture issues come from handling the deflated product while storing it. A wedding ring or cupboard handle is usually the culprit. These products are designed to withstand some abuse but as with any manufacturing process, there will sometimes be a problem with leaking. 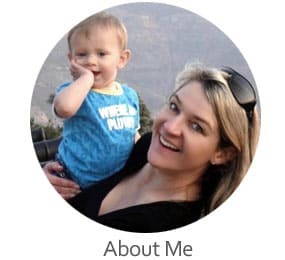 For this reason, we’ve focused on products with excellent customer support. The defect will usually lie with an individual product and in many cases, ordering a replacement is all that’s needed to resolve the issue. Amazon has a fantastic returns policy for faulty products. These can be extremely frustrating to find. You may need to listen really carefully for the soft hiss of air escaping the mattress. You could also take a wet, soapy cloth to wipe the entire surface down. You should see bubbles appear at the leak. Don’t stop there… after a while, you’ll usually find more than one. Once you’ve checked the all the sides and you know the full extent of the damage, you can consider repairs vs. replacement.